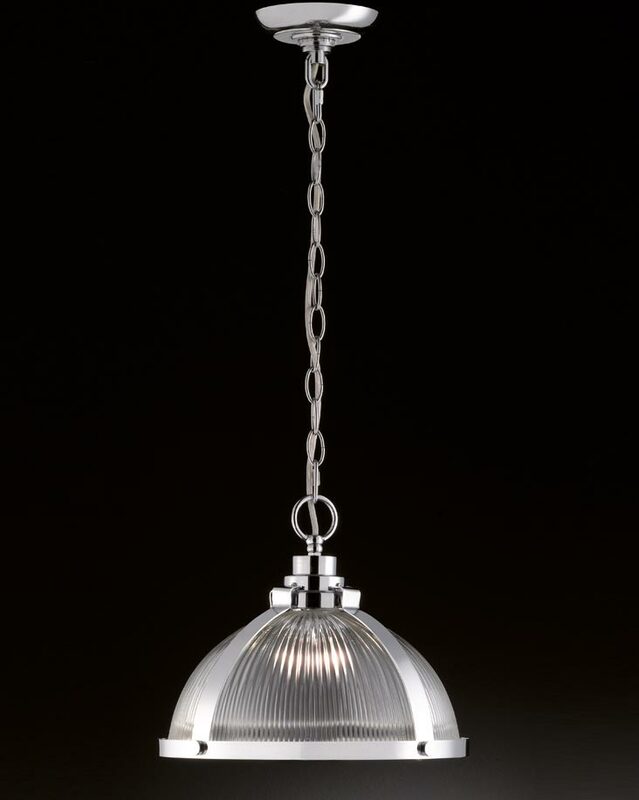 This Franklite Charter 1 light ceiling pendant in polished chrome finish with ribbed glass shade is traditional and elegant. Featuring ceiling cup and chain leading to a stepped shade fitter, with top eye, radiating metal bands and thumb screws securing the glass. A domed ribbed glass shade sits inside for an all-round diffused light making it ideal lighting for over a dining table, in a living room or kitchen area. Will accept an LED lamp bulb and height adjustable at the time of fitting, please see the technical information below for dimensions. Part of the Charter pendant lighting collection which includes alternative fittings that can be viewed below. This traditional light is supplied by Franklite Lighting who have been one of the pioneers in the design, manufacture and distribution of high quality lighting such as the Charter 1 light ceiling pendant in polished chrome finish with ribbed glass shade you see here.